The YS-D1 is the most advanced strobe SEA&SEA has produced in its 40 year history. Drawing on inspiration from the YS-110, YS-110 Alpha and YS-50Pro, the YS-D1 is robust in features, but compact in size. The YS-D1 includes revolutionary technology such as DS-TTLII with exposure compensation adjustment, an auto-sensing slave switch, built-in high intensity LED target light, and a variable guide number from 32 to 20. It’s 25% more powerful and 10% smaller than the YS-110 Alpha and is compatible with fiber optic cable and 5-pin N-type sync cords. The YS-D1 comes standard with 2 diffusers and 2 strobe mounts and is powered by 4xAA batteries. You can switch between DS-TTL (Digital Slave TTL) and a ten-level manual control function, to enable fine adjustment of the light level according to the photographer’s intentions. You can also set up a lighting system that uses two strobes in DS-TTL mode. Power comes from four AA batteries for a powerful and long-lasting strobe. You can enjoy taking pictures all day long without having to recharge the batteries. The recycle time takes about two seconds with nickel-metal hydride batteries (2700 mAh) for stress-free continuous shooting. The YS-01 is furnished with a high-luminance white LED target light (1W) indicating the optical axis of the strobe attached to its front face that is effective for night diving. From compact digital cameras to digital SLR cameras. ?A small manual slave strobe. A manual strobe with exceptional cost performance. Circular beam angle of 100°x100° and guide number of up to 20. The YS-02 is a new compact-type slave strobe that can be used for all applications from wide-angle to macro photography. You can use the YS-02 as a manual slave strobe with the guide number control function, which can set the light level to any of ten levels. Accurate pictures that follow the photographer’s intentions can be taken while the light level is adjusted with the guide number controller. The YS-02 is equipped with a pre-flash cancel mode (*1) that is compatible with a wide range of digital cameras with a pre-flash. Power comes from four AA batteries for a powerful and long-lasting strobe, so you can enjoy taking pictures all day long without having to recharge the batteries. The recycle time takes about two seconds with nickel-metal hydride batteries (2700 mAh) for stress-free continuous shooting. You can fully exercise your creativity with the YS-02, which can be used as a primary strobe or secondary strobe in a wide range of applications, from compact digital cameras to digital SLR cameras. *1 Some digital cameras adjust flash levels after a first flash and then capture an image with a second (main) flash. This first flash is called the pre-flash. The strobe’s pre-flash cancel function ignores the pre-flash and synchronizes the strobe with the main flash. The YS-110a introduces numerous new exciting functions, opening a whole new digital generation. 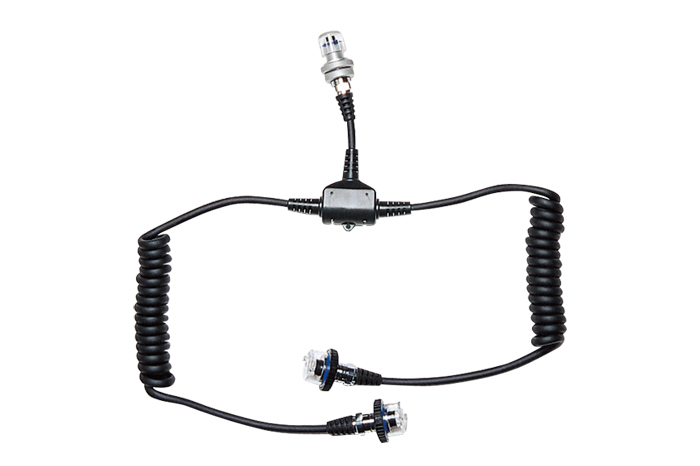 For example, by connecting it to digital cameras with pre-flash function using a fiber-optic cable, the YS-110a can be used in the fully automatic DS-TTL adjustment mode (Digital Slave TTL). Enjoy complete creative control – when you want absolute control over fine light adjustments, you can use a main strobe in DS-TTL mode and a secondary strobe in manual mode or you can set up an advanced lighting system using two strobes in DS-TTL mode. The DS-TTL adjustment function is also available using the light level control dial for fine control of the light amount when taking pictures in DS-TTL mode. You can also choose from 13 levels of manual controls when you do not want to leave the light adjustment up to the camera. The flat, round, 105° beam angle (with diffuser), achieved by the balanced positioning of the 3 flash tubes, and the power of a Guide Number 22 are examples of the excellent performance of the strobe that is sure to satisfy even the most demanding professionals. – LED target light*1 Number of flashes and recycle time depends on the battery brand, temperature and frequency of use. *2 Number of flashes and recycle time of Ni-MH batteries were tested on 2700mAh batteries. The YS flagship model for professionals is fast and powerful with broad coverage: guide number 32, beam angle 105. The YS-250PRO is designed for demanding professionals, packed with revolutionary new features to meet the challenges of digital photography. A large circular arc tube emits a powerful flash at guide number 32 (its value on land, ISO 100/m) when power is set to FULL. It provides incremental manual flash power adjustment in 12 steps for graduations of light. The YS-250PRO is lightning fast: it recycles in 1.8 seconds. Its high-capacity Ni-MH battery, designed exclusively for the strobe, stores enough power when fully charged for 200 full flashes. A high-luminosity white LED target light in the center of the strobe shows precisely where the strobe is pointed, and a ready lamp and a TTL confirmation lamp on each side of the strobe indicate when the strobe is charged and when it has been controlled by the camera’s TTL. An audible signal sounds when the lamps light so you can concentrate on your subject in the viewfinder. 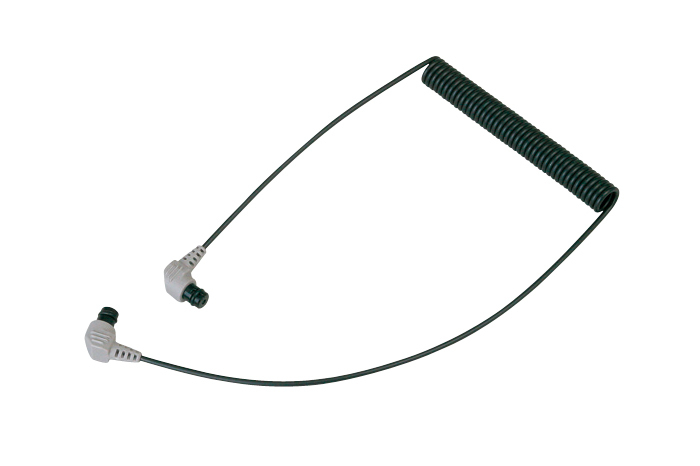 This fiber-optic cable resists bending and has improved light-conducting efficiency. *This fiber-optic cable can be use with DX-GE5/DX-2G/DX-1200HD/DX-1G. 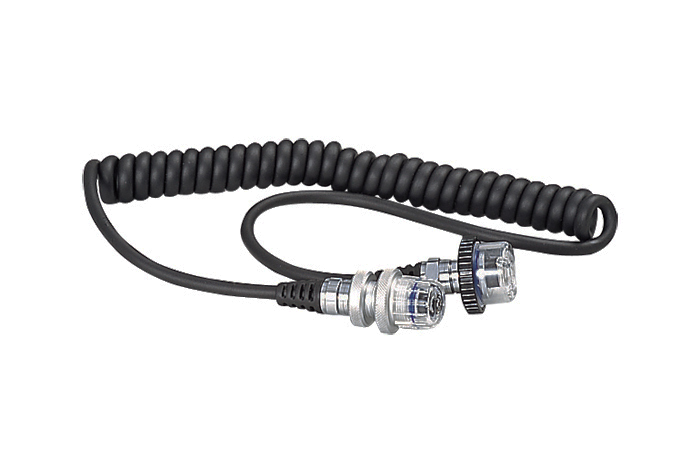 *This fiber-optic cable can be use with RDX-series/MDX-D7000/MDX-7D/MDX-D300s/MDX-PRO D700.